Betty has a calling... a strong inner impulse toward a particular course of action. I cannot say whether her calling is accompanied by conviction of divine influence, but I can say that she wants to set on eggs. She wants it real bad. She has hardly left the nest in 4 days. Even when I come by with good eats, she just hums softly and nestles in to the straw, where she has been gradually lining the box with some of her downier feathers. She is determined and certain of her purpose, and it makes me feel so sad to take the eggs in. No rooster, no chicks... no matter how long she sits on them. Poor Betty. Poor Amelio, our would-be rooster was a gentleman and gentle suitor to his lady love, Betty. You mustn't think I am overly sentimental. You have only to hear Betty croon and coo, to see her dedication and look in to her maternal chooky eyes, to know her intentions are sincere. Our 3 chicas of El Rancho were sweet ladies, but none of them displayed mothering instincts. If they had behaved the way Betty is, we would have had the space to bring in a sweetheart... no paramour, but a real partner and companion, but Betty is not in that fortunate situation. She will have to find some other hobby or outlet. Her Valentine's Day will be without chocolates and flowers. And she will have no Mother's Day. Poor Betty. Betty, I recommend you take up teaching. we had a hen so determined; she would set for weeks at a time, every year. I finally got fertilized eggs from a friend's henhouse just to give her some job satisfaction. Betty's skills are pretty limited, but I will offer the suggestion. No roosters at Garage Mahal, because we are renters living in a very conventional urban-suburban neighborhood... we are pressing our luck just having hens! MB, was it successful, the fertilized eggs? Did they hatch etc.? That could be so cool, but also something we would have to do at another address. 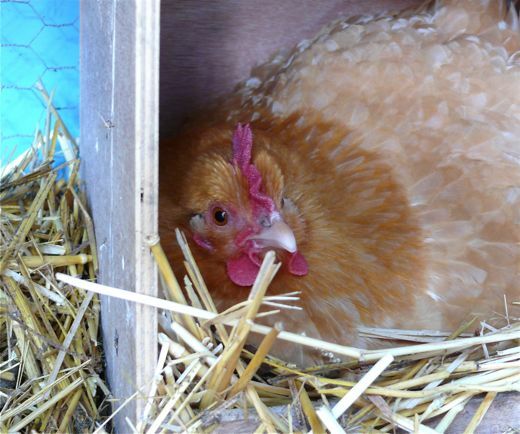 We have had chickens that are determined to nest even without eggs. We finally have to carry them out of the coop and close the door. They wont eat or drink. Then they stand there until night and I open the door. Fierce determination in the face of utter impossibility. The pictures are very very nice. I would frame one and hang it in my house. Such a cutie she is. Too bad you can't allow her to hatch an egg or two. I bet she would be a good mama! 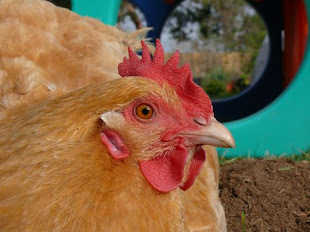 Is she a Buff Orpington? By her coloring, looks like she might be. They are extremely devoted mothers. 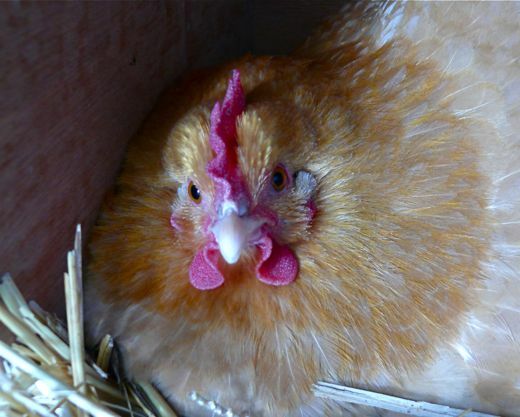 My Buff Orpington Susan sat on a nest for nearly 30 days last summer. I did everything I could think of to discourage her, but she would not be distracted from her mission. Next summer I plan to let her have a clutch of eggs to hatch. giving her fertilized eggs DID work. She hatched two & was very attached to her babies. They were a funny family: she was quite small & dark like a Sumatra (I got her at the Tractor Supply) & the babies were great big leghorn-looking things. She was a very sweet mother hen, but took to setting again when they grew up. My sweet Cutie Pie has also done this... but when I kept taking the eggs from her day after day, she finally gave up and is now tromping 'round like the rest of them. I actually have two fertile eggs on their way to me from California - I may have to put them in an incubator if she won't sit on them now... LOL!